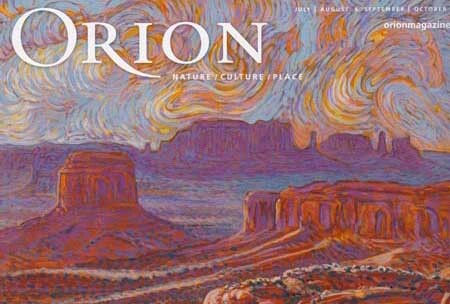 Many thanks to Orion Magazine for permission to share a piece from their July-September issue, “I, Snow Leopard,” a poem by Jidi Majia (Translated from the Chinese By Frank Stewart) with an Introduction by Barry Lopez. Jidi Majia is an indigenous poet of the Nuosu (Yi) people of southwestern China’s mountains. His poetry expresses the mythic world and cultural tradition of the Nuosu, while displaying a deep concern with the urgent problems of global strife. “Speaking in the voice of the endangered Snow Leopard, Jidi Majia conjures a mysterious, magnificent creature with a message about the consequences of unchecked violence toward animals – and equally about the violence that threatens the heart of the human species. He evokes a dramatic presence of Snow Leopard – the smoke-gray fur chased with a pattern of dark rosettes “spun from limitless space;” the long, thick tail for balance as it bounds across a cliff face; …- an animal possessing both metaphorical weight and biological authority.” (From the review of the poem by Small Press Distribution). Photographs courtesy of the Snow Leopard Conservancy accompany the Orion piece.